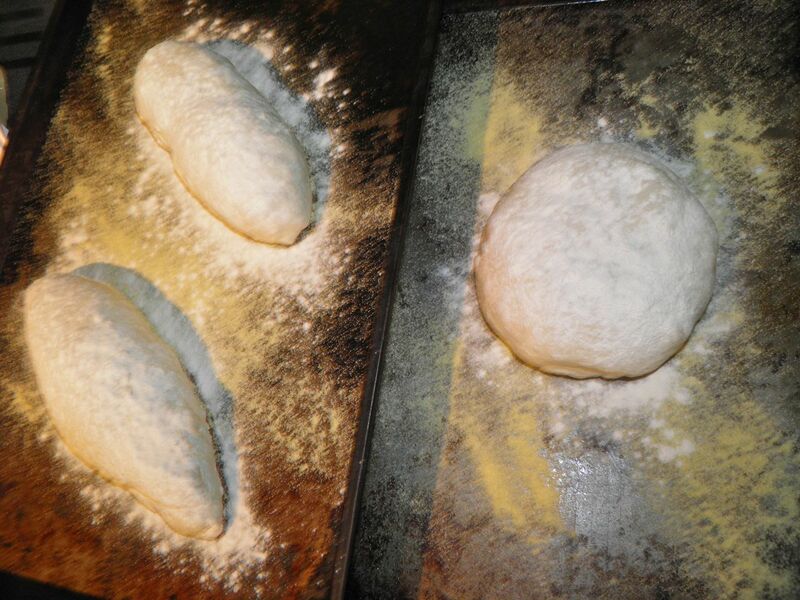 4-1/2 cups of flour, some yeast, salt and water. Magical. There’s something about turning a few cups of flour into bread that’s kind of magical. It’s also an activity that is far less labour intensive than many would assume. It takes time, but much of it is waiting, so you can do anything else you want – even go to the mall. There’s three main stages in making bread, all simple. You have to make sure your yeast is alive. The first – and most important – is making sure your yeast is alive. How to do that? “Proof” the yeast in warm water. Proofing means making sure it activates. The yeast gets creamy in the water. If it doesn’t, it’s no good and you need to go buy new yeast. Inactive yeast doth not good bread make. The temperature of the water needed is easy too, regardless if you have a thermometer or not. It’s supposed to be between 110°-115°F. Coincidentally, that’s about the temperature you would normally make a baby’s formula. Warmer than your skin temperature, but not too much. Parents often test it on their wrists. Your dough will at least double in size. The second stage is mixing and kneading. You bring the water and flour together and then manhandle the dough. 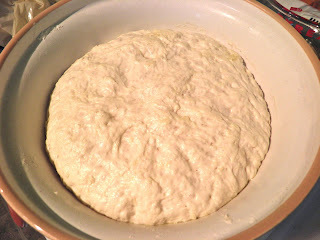 This kneading helps develop the gluten that is (usually) necessary to give the bread structure. It also allows for the bread to trap gas that makes all those wonderful holes. This recipe is no-kneading. As such the structure is different than if you did. My main fault with making bread is my patience. Sometimes kneading can take 10 minutes. I usually shorten that time, but i shouldn’t. It’s good exercise, and somewhat therapeutic. Because of my action, my bread usually comes out good, but all very similar in structure. I have to change that habit. The third stage is shaping. You divide the dough and make the shapes you want. Each recipe has different directions on how to do this. The easiest is to plop some into a loaf pan. Others are more complicated, but also more beautiful. One final rise and you’re ready for the oven. So to recap, if you can check to make sure your yeast is alive, knead some dough and do a final shape you can successfully make bread. And let’s be clear, there’s hardly any smell more glorious and homey than bread baking in the oven. 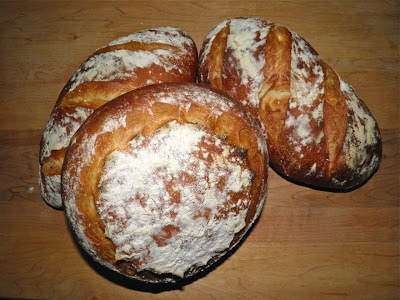 From this recipe I made two smallish oblong loaves and one round one for a family sandwich. The crumb, since this is no kneading, was quite even. It still made bread that was soft, moist and delicious. For my round loaf I let it rise for the second time and then snipped with scissors around the top just before baking. This forms a “crown of thorns” when baked. This is how I snipped the top of the round loaf. 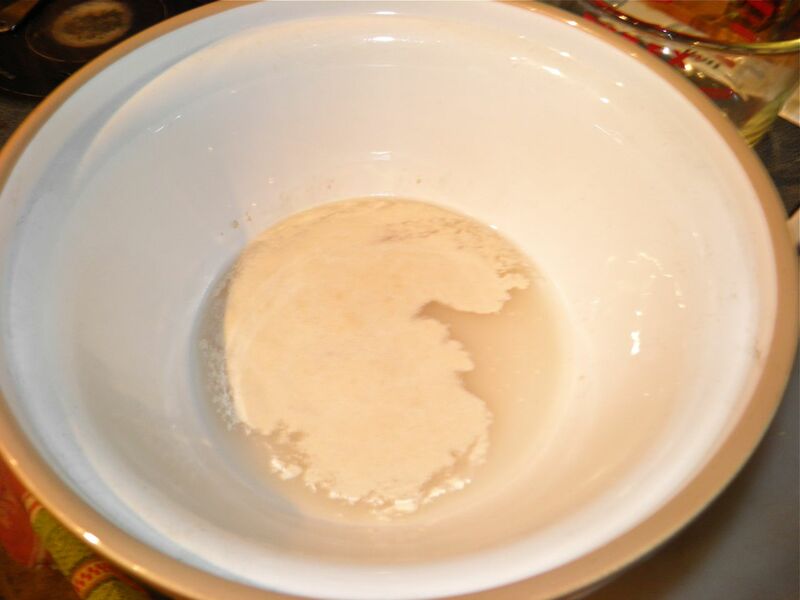 Place the water in a large mixing bowl and add the yeast and sugar. Let proof for 15 minutes. The yeast should be creamy at the end of that time. If not your yeast is not alive. Throw it out and start with fresh yeast. Your bread will not rise. Dough this wet will look somewhat unpromising. 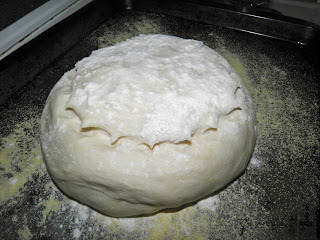 Kneading (until smooth and elastic) allows for the formation of gluten which makes small air pockets. Not enough kneading will make the finished interior more even. Therefore the interior of this bread is quite even. 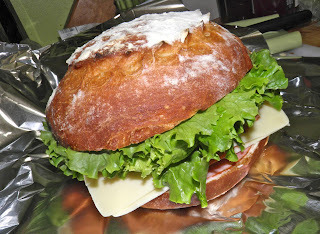 Quartered, this one sandwich fed 3 with a side dish. Pour the oil over the top of the dough and swirl it around to coat it and the inside of the bowl. Cover with plastic wrap and a tea towel and let rise until doubled or more, about 2 hours. I usually put the entire bowl inside a plastic grocery bag and tie it tight instead of using plastic wrap. After the dough has risen punch it down and divide into 3 equal pieces. Generously flour your hands and a board. Shape each piece by pulling in underneath to create a long loaf, about 8” long. By this I mean make each piece a ball by using the sides of your palms to gently pull the dough into a round shape. It's like you're "cupping" it with your palms. From there, coax it into an oblong by using the same technique. As you finish, place the shaped loaves on baking sheets that have corn meal sprinkled on them. Let rest for a further hour for a second rise. After the bread has risen again, cut three slits diagonally across each loaf. Sprinkle each loaf liberally with flour and place in the oven. Bake for 25-30 minutes or until the crust is a deep golden brown.